Believe it or not, but if you wet a pair of cotton socks in very cold water (wring them out) and then cover them with a large pair of wool socks and then simply go to bed, you are doing your body wonders. ‘Wet Socks’ work to improve circulation and lymphatic drainage by encouraging blood flow to the feet and extremities, as the body attempts to warm and dry the socks. Your feet need to be warm before you start the treatment, so take a bath or warm foot bath for 20 minutes prior to bed if you tend to be chilly. The dry cotton or wool socks provide insulation against the air to prevent drying or warming of the cold, wet socks. As a result, your body has to work to both warm and dry your feet. As your body warms your cold feet, more circulation is directed to your lower extremeties, and as a result your whole body receives more circulation. Lymphatic drainage is also stimulated as your body attempts to dry your feet , so excess fluid can be reduced anywhere in the body. So next time you are feeling less than perfect, instead of reaching for medication, give the ‘wet socks’ technique a try! 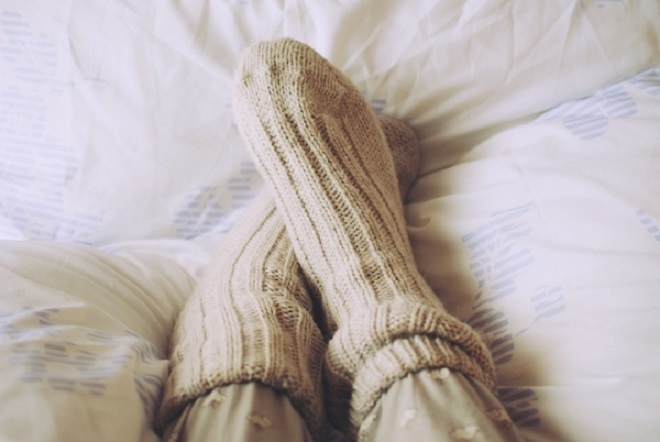 Warming socks can be used to clear congestion in the nose and sinuses or lungs, to reduce edema and/or swelling, reduce inflammation anywhere in the body, and to improve overall health. For more information, speak with Jane Goehner, ND.